Meat Racket excerpt: How Tyson keeps chicken prices high. A handful of companies are so powerful they can raise meat prices with a single decision—no collusion necessary. Just three companies make almost half of all chicken in the U.S. This essay is excerpted from The Meat Racket: The Secret Takeover of America’s Food Business, by Christopher Leonard, published by Simon & Schuster. Read another excerpt from The Meat Racket, about how the meat industry bested the Obama administration, here. Today’s meat industry is a technological marvel. The inside of a modern-day poultry slaughterhouse looks like a hellish version of Willy Wonka’s chocolate factory. Chicken carcasses spin along automated disassembly lines, chopped and sliced and cooked by machines that can turn 1 million birds a week into frozen packages of nuggets that are stacked on pallets and shipped around the nation. But this technological sophistication is deceiving. In fundamental ways, the meat business has returned to the state where it was 100 years ago, a time when just four companies controlled the market with a shared monopoly. Four companies make 85 percent of America’s beef and 65 percent of its pork. Just three companies make almost half of all chicken. These figures even understate the reach of the modern meat monopoly, which includes companies like Tyson Foods and Cargill Inc. Today’s meat conglomerates control the food system in a way that that old-school companies could only dream of. Companies like Tyson Foods have pioneered a new model of food production that gives them ownership and control over virtually every stage of the business. In the chicken business, for example, Tyson Foods owns the breeding company that determines which birds are raised, the hatcheries where chicks are born, and the chickens that it delivers to contract farmers who raise them. It owns the feed mills that fatten the birds up, the slaughterhouses where the birds are processed, and the trucking lines that deliver the meat. Tyson Foods has finally answered the age-old question: Before there is the chicken or the egg, there is a multinational meat corporation. This tightly integrated model has become the norm in pork production and also allowed companies like Tyson to corner the beef market. The results of this consolidation have been predictable. Meat prices are climbing relentlessly. Farmers are earning a steadily smaller share of every dollar that consumers spend on meat. The profit margins of the nation’s biggest meat packers rose dramatically between 2008 and 2010 (the most recent year for which good data is available), even as the national economy cratered. Tyson Foods, the nation’s biggest meat company, reported record profits of $778 million last year as the company hiked prices for beef, pork, and chicken. Last Friday, the company’s stock closed at $39.45 per share. At the heart of these profits is Tyson’s ability to reach broadly across the national markets for beef, chicken, and pork. Perhaps no man understands that reach better than Donnie Smith, who is CEO of Tyson Foods. In 2008, Smith was a senior executive at Tyson’s poultry division. He was a trim man, who still looked young and healthy at 49 years old. He was a natural company man, with a thick Southern accent, a sharp business sense, and a self-deprecating manner that masked his ambition. Smith steadily climbed the ranks at Tyson since joining the company in December 1980, his upward career trajectory mirrored Tyson’s explosive growth during the boom years of industrial meat production. But just as he was in line to become the company’s CEO, it looked like the whole chicken business was falling apart. Arriving to work at Tyson Foods in 2008 was like reporting for duty on a sinking ship. The economy was in a state of collapse that winter, with banks failing and the stock market crashing deeper each day. But even that broad chaos was just a distraction from deeper problems that had all but crippled Donnie Smith’s poultry division over the last couple of years. The cost of feed grains like corn had reached the highest levels in history due to new ethanol subsidies, wiping out a cushion of cheap feed that helped keep Tyson profitable for more than a decade. At the same time, consumer demand had fallen through the floor. Americans weren’t eating at restaurants or buying Tyson’s chicken nuggets at the grocery store. For the first time since World War II, per capita chicken consumption wasn’t growing on a year-over-year basis. For 50 years, the economic underpinnings of the U.S. economy had been breaking in Tyson’s favor. But now that Smith was almost in charge, the tide of history was going the other way. The story was told in stark terms by an electronic banner just inside the doorway of Tyson’s front lobby. All day long, the banner ran a display of Tyson’s stock price. That month, some of the most dismal numbers in all the company’s history crawled across the display: … $7.02 … $7.12 … $7.19. A decade before, the stock had been worth $25 or more a share. In November of 2008, Smith attended a series of meetings where Tyson executives figured out how to respond to the crisis. The conclusion they came to was simple: They needed to cut back production to keep chicken supplies lower. That would soon help drive prices up. Every two weeks, Smith met with the group of Tyson’s other top executives to get a real-time picture of the U.S. meat market, with data provided by Tyson’s supply chain group. During November, Smith and his colleagues got a series of alarming presentations from Tyson’s separate divisions, including the beef and pork groups. The supply chain forecasters had collected raw numbers from the sales teams, showing how much meat big customers like McDonald’s and Walmart were buying. More importantly, the teams used sophisticated software programs to predict how much meat the big clients would buy during the next 180 days. The November supply chain meetings showed that Tyson was dumping far too much fresh meat into the market. Inventories were building up, and the company was forced to sell chicken at a massive discount to traders, who turned around and unloaded the meat onto global commodity markets. No one in the room was excited about the idea of a production cut. It was Tyson’s nuclear option. It meant the company would intentionally scale back its business, cutting down its sales. It also meant farmers would get fewer deliveries of chickens, reducing their income even as their debt payments stayed the same. But Smith decided that a cutback was inevitable. Ultimately, Tyson cut its production by 5 percent in December. Around that time, the industry as a whole was estimated to have cut back the placement of new eggs between 6 and 7 percent. In a matter of weeks, the price of a boneless, skinless chicken breast rose by about 20 cents, according to an industry estimate. Within a short few months, Tyson’s chicken business was profitable again. What was remarkable about this plan was the fact that Tyson executives could even consider it. Decades of lax antitrust enforcement allowed Tyson Foods to buy most of it competitors, giving executives at company headquarters the ability to control production on thousands of farms and dozens of major poultry plants across the nation. In 2008, Tyson Foods and its competitor Pilgrim’s controlled more than 40 percent of the national market. The third-biggest company controlled just 8 percent. Modern American farming was run out of the central office. Back in the 1970s, the Department of Justice sued more than 36 poultry companies for conspiring to cut chicken production and keep prices high. Together, those companies controlled about half the chicken market. Today, just three companies control that share of the market. Because Tyson owns and operates so many chicken factories, collusion isn’t necessary for massive production cuts. The result can be achieved in the kind of supply chain meetings that Donnie Smith attended in 2008. Production cuts and meat price hikes seem to have become central to Tyson Foods business plan. 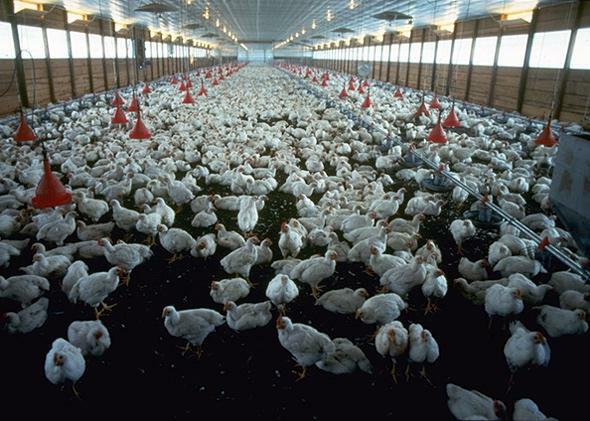 Between 2006 and 2012, Tyson Foods would raise chicken prices five out of the six years. It raised pork prices four out of the six years and beef prices five out of the six years. Tyson and its competitors raised prices in part to offset higher grain costs. But more expensive feed does not automatically translate into more expensive meat, as many business commentators seem to think. Higher grain costs hurt profits and incentivize meat producers to raise prices. But ultimately, the price of meat is determined by the laws of supply and demand and what consumers are willing to pay at the grocery story. The only way to raise meat prices is to cut supply. In the 1960s, no single poultry company had enough market share to be able to cut supplies enough to raise prices. Today, they do. Last year, Tyson Foods raised prices for beef, pork, and chicken even as grain prices fell. All signs indicated that the big four meat producers plan to do the same thing this year. Price hikes clearly helped the big four companies turn bigger profits. The operating profit margins of the nation’s top four meat companies doubled between 2008 and 2009, even in the face of an economic crisis. The top four meat companies more than doubled their operating profit margins again to 4.5 percent between 2009 and 2010, the most recent year for which data is available, according to U.S. Department of Agriculture figures. To be sure, a 4.5 percent margin isn’t the fattest in the business world. What is notable is that the margin increased during years of economic stagnation, as consumers cut back spending on meat and farmers struggled to stay in business. In 2012, the Obama administration proposed a series of new antitrust measures that might have curbed the power of big meat companies, but the reforms were ultimately beaten back by a massive lobbying effort. The meat trust’s hold on the market is unshaken. This result could have been predicted more than a decade ago by a man named Jim Blair, who was a longtime confidant of Smith’s predecessor, Don Tyson, and a top attorney at Tyson Foods. Sitting in his comfortable hilltop home in Arkansas, Blair recalled an internal discussion at Tyson Foods back in 2001, when the company was planning its biggest merger ever: the acquisition of a massive beef and pork producer called IBP. Blair remembers advocating for the deal, even though Don Tyson had reservations. “I thought, if you take the company up to $25 billion in sales, it makes it bulletproof. It puts it in the too-big-to-fail category,” Blair recalled. When asked if Blair had thought the IBP acquisition would make Tyson immune to challenges from other meat companies or the government, he didn’t hesitate. From The Meat Racket by Christopher Leonard. Copyright © 2014 by Christopher Leonard. Printed by permission of Simon & Schuster, Inc.